For maximum efficiency, SanDisk Extreme PRO SDHC and SDXC UHS-I Cards deliver extremely fast transfer speeds of up to 95MB/s* for post-production workflow. Write speeds of up to 90MB/s*handle rapid shots, sequential burst mode, and RAW plus JPEG capture with ease. 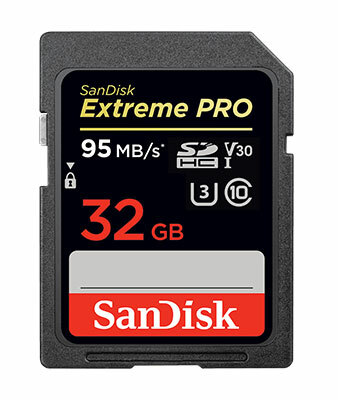 With UHS Video Speed Class 30 (V30) [32GB-256GB cards only] and UHS Speed Class 3 (U3)2ratings, the SanDisk Extreme PRO SDHC and SDXC UHS-I Cards let you capture uninterrupted 4K UHD and Full HD video1. This makes it ideal for professionals recording extreme sports and other fast-action activities without dropping frames. Viewpoint Electronics © All rights reserved.